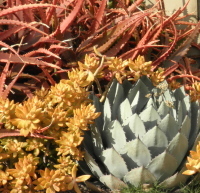 Do you feel like you are falling apart, yet look okay, like these plants? A panic attack out of the blue can make you think you are going crazy! If you are organized, in control and competent in managing your life, then the odd panic attack can throw you off balance. It can be unsettling and sap your confidence, making you question your whole way of operating. They make you feel dizzy, disorientated, like your heart is going to burst out of your chest and make you gasp for breath! Panic attacks have a purpose. They seem to come out of nowhere but if you look back at your life you can see how the anxiety built up over problems that you never solved, and are coming back to haunt you. A panic attack can alert you to a struggle that you have had for a while, failed to resolve and now needs your attention. John was a doer. He made sure that his plans bore fruit. He worked hard, got others motivated and took up their slack even if he was resentful in the process. No matter how much he wished and hoped that everyone around him would do their part he doubted them. He didn’t trust that they would fulfill their obligations as he expected. So he basically did his job and their jobs too. It was exactly like the problems he had with his dad. If John didn’t watch out for his mother, she could have died several times over of a drug overdose. John was the one who took care of his mother making sure that she was doing okay and staying clean. John didn’t want to loose his mother, and giving up his life to make sure his mother stayed alive became his mission. John was trapped and felt unable to find a comfortable way out! If he didn’t take care of his mother and keep her alive, he would lose her. That was unbearable. Better to have a mother who used drugs, than no mother at all. If he left home and lived his own life his mother wouldn’t take care of herself, and there was no possibility of his father or other relatives taking on that responsibility. If he left home and followed his passion, the guilt would kill him. If he left home and made a separate life for himself he would never enjoy it because he would consider himself the de facto murderer of his mother. He wasn’t able to commit to a girlfriend because he wasn’t free. He wasn’t free to pick his own career as he had to be near his mother and do something she approved of. Keeping her happy was the only way he knew to prevent her taking drugs. As John got older the trap became more invidious. The conflict was unbearable. John’s stress levels were through the roof. Did he live his own life and risk being orphaned, or did he give up his life in order to have a mother who was alive and cared for him in her own weird way? A few minor panic attacks began to disrupt his neatly balanced dilemma. At first John managed to cope and hide them from everyone else. But the attacks became more frequent, and embarrassed him in public. He was ashamed of his inability to get the better of the panic attacks. His carefully constructed image of self-sufficiency was crumbling. Despite John feeling like he had everything under control, the panic attacks debilitated him. They forced him to focus on himself and his health. He couldn’t deal with the stress any longer. The panic attacks gave John a legitimate excuse for taking his eye off his mother and thinking about himself. He could no longer live in hope that his mother would get her act together and take care of herself. He could no longer hope that she would set him free by taking responsibility for herself. He had to make a choice- His mother or him. The panic attacks gave John permission to take care of himself without guilt. It was the beginning of John making a distinction between taking care of his mother so that she would then let him go and taking care of himself directly. It took a lot of courage for John to admit that he couldn’t beat this on his own. He got scared that if the panic attacks didn’t stop he would not only be unable to take care of himself but he would be unable to make sure his mother stayed healthy and alive. In therapy, John learned to understand the massive conflict that he had lived with all his life. It was very difficult for him to do what he ‘knew’ he should have done a long time ago. photograph, copyright, Jeanette Raymond, Ph.D.
John had always believed he was in control of his life, but the panic attacks showed him otherwise. Now he had the chance to really take charge! John had always ‘known’ that it wasn’t his job to take care of his mother, but he felt compelled to do so in order to avoid being abandoned and orphaned. In therapy he learned that no matter how hard he worked to care for his mother, she was going to choose her own path and he was not responsible, nor guilty if he accepted it. Once John came to understand the enormity of his struggle and conflict the panic attacks stopped. He didn’t need them anymore, because he started addressing his fear of abandonment and his guilt at wanting to be set free. He realized that he had trapped himself and he was the only one who had the key. It was very difficult to let go of his hope that he would get his mother to change and set him free. John took tiny steps away from his care taking role. Panic attacks were John’s birthright gift in disguise. He heard it and used it wisely to his advantage. Disclaimer: this article is for informational and educative purposes only. There is no liability on the part of Dr. Raymond for any reactions you may have while reading the article or implementing any suggestions contained therein. Interacting with this material does not constitute a therapeutic relationship with Dr. Raymond.